Nazi Germany's attack on Greece. 1Statistics about the strength and casualties of Italy and Greece refer to both the Greco-Italian War and the Battle of Greece (at least 300,000 Greek soldiers fought in Albania). Statistics about Germany's casualties refer to the Balkans Campaign as a whole, and are based on Hitler's statements to the Reichstag on May 4, 1941. 2Including Cypriots and Palestinians. British, Australian and New Zealand troops were approximately 58,000. The Battle of Greece (also known as Operation Marita, German: Unternehmen Marita) was a World War II battle that occurred on the Greek mainland and in southern Albania. The battle was fought between the Allied (Greece and the British Commonwealth) and Axis (Nazi Germany, Fascist Italy and Bulgaria) forces. In March 1941, a major Italian counterattack failed, and Germany was forced to come to the aid of its ally. Operation Marita began on April 6, 1941, with German troops invading Greece through Bulgaria in an effort to secure its southern flank. The combined Greek and British Commonwealth forces fought back with great tenacity, but were vastly outnumbered and outgunned, and finally collapsed. Athens fell on April 27. However, the British managed to evacuate about 50,000 troops. The Greek campaign ended in a quick and complete German victory with the fall of Kalamata in the Peloponnese; it was over within 24 days. Nevertheless, both German and Allied officials have expressed their admiration for the strong resistance of the Greek soldiers. “ Hitler always faces me with a fait accompli. This time I am going to pay him back in his own coin. He will find out from the papers that I have occupied Greece. At the outbreak of World War II, Ioannis Metaxas, the Prime Minister of Greece, sought to maintain a position of neutrality. However, Greece was increasingly subject to pressures from Italy, which culminated in the Italian submarine Delfino's torpedoing of the Greek cruiser Elli on August 15, 1940. Benito Mussolini was irritated that Nazi leader Adolf Hitler had not consulted with him on his war policy, and wished to establish his independence,a[›] and to match the military success of the Germans through a victorious attack on Greece, a country he regarded as an easy opponent. On October 15, 1940, Mussolini and his closest advisers decided to invade Greece.b[›] In the early hours of October 28, Italian Ambassador Emmanuel Grazzi presented Metaxas with a three-hour ultimatum, in which he demanded free passage for troops to occupy unspecified "strategic sites" within Greek territory. Metaxas rejected the ultimatum (the refusal is commemorated as Okhi Day, a national holiday in Greece), but even before its expiration, Italian troops had invaded Greece through Albania.c[›] The principal Italian thrust was directed at Pindus, near the city of Ioannina, and initially made progress. The Italians then crossed the Thyamis (Kalamas) river, but were driven back and pursued into Albania. Within three weeks, Greek territory was clear of the invaders, and a successful counterattack was underway. A number of towns of South Albania fell to Greek forces, and neither a change in Italian commanders, nor the arrival of a substantial number of reinforcements had much effect. First Italian offensive October 28 *ndash; November 13, 1940. Greek counter-offensive November 14, 1940 *ndash; March, 1941. Second Italian offensive March 9 *ndash; April 23, 1941. The Battle of Greece is generally regarded as a continuation of the Greco-Italian War, which began when Italian troops invaded Greece on October 28, 1940. Within weeks the Italians were driven from Greece and Greek forces pushed on to occupy much of southern Albania. After weeks of inconclusive winter warfare, the Italians launched a full-scale counterattack across the entire front on March 9, 1941, which, despite the superiority of the Italian armed forces, failed. After one week and 12,000 casualties, Mussolini called off the counterattack, and left Albania 12 days later. Modern analysts believe that the Italian campaign failed because Mussolini and his generals initially allocated meagre military resources to the campaign (an expeditionary force of 55,000 men), failed to reckon with the autumn weather, and launched an attack without the advantage of surprise and without the support of the Bulgarians. Even elementary precautions, such as the issue of winter clothing had not been taken. Nor had Mussolini taken into consideration the recommendations of the Italian Commission of War Production, which had warned that Italy would not be able to sustain a full year of continuous warfare until 1949. During the six-month fight against Italy, the Greek army made local gains by eliminating enemy salients. Nevertheless, Greece did not have a substantial armaments industry, and both its equipment and ammunition supplies increasingly relied on stocks captured by British forces from defeated Italian armies in North Africa. In order to feed the battle in Albania, the Greek command was forced to make withdrawals from Eastern Macedonia and Western Thrace. Anticipation of a German attack expedited the need to reverse the position; the available forces were proving unable to sustain resistance on both fronts. The Greek command decided to support its success in Albania, regardless of how the situation might develop under the impact of a German attack from the Bulgarian border. Hitler intervened on November 4, 1940, four days after the British took both Crete and Lemnos. The Führer ordered his Army General Staff to prepare for an invasion of Northern Greece via Romania and Bulgaria. His plans for this campaign were incorporated into a master plan aimed at depriving the British of their Mediterranean bases. On November 12, the German Armed Forces High Command issued Directive No. 18, in which they scheduled simultaneous operations against Gibraltar and Greece for the following January. However, in December 1940, German ambition in the Mediterranean underwent considerable revision when Spain's General Francisco Franco rejected plans for an attack on Gibraltar. Consequently, Germany's offensive in Southern Europe was restricted to the campaign against Greece. The Armed Forces High Command issued Directive No. 20 on December 13, 1940. The document outlined the Greek campaign under the code designation "Operation Marita," and planned for German occupation of the northern coast of the Aegean Sea by March, 1941. It also planned for the seizure of the entire Greek mainland, if that became necessary. During a hastily called meeting of Hitler's staff after the unexpected March 27 coup d'état against the Yugoslav government, orders for the future campaign in Yugoslavia were drafted, as well as changes to the plan for the attack on Greece. On April 6, both Greece and Yugoslavia were to be attacked. Australian soldiers in Alexandria, Egypt embarking for Greece (Australian War Memorial, Canberra). Britain was bound to assist Greece by the declaration of 1939, which stated that in the event of a threat to Greek or Romanian independence, "His Majesty's Government would feel themselves bound at once to lend the Greek or Romanian Government […] all the support in their power." The first British effort was the deployment of RAF squadrons commanded by John d'Albiac, which were sent in November 1940. 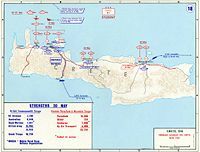 With the consent of the Greek government, British forces were dispatched to Crete on October 31 to guard Suda Bay, enabling the Greek government to redeploy the 5th Cretan Division to the mainland. On November 17, 1940, Metaxas proposed to the British government the undertaking of a joint offensive in the Balkans with the Greek strongholds in South Albania as the base of the operations. The British side however was reluctant to discuss Metaxas' proposal, because the deployment of the troops the implementation of the Greek plan demanded would seriously endanger the Commonwealth military operations in North Africa. During a meeting of British and Greek military and political leaders in Athens on January 13, 1941 General Alexandros Papagos, Commander-in-Chief of the Hellenic Army, asked Britain for nine fully-equipped divisions and corresponding air support. The British responded that, because of their commitment to the fight in North Africa, all they could offer was the immediate dispatch of a small token force of less than divisional strength. This offer was rejected by the Greeks who feared that the arrival of such a contingent would precipitate a German attack without giving them any sizable assistance.d[›] British help would be requested if and when German troops crossed the Danube from Romania into Bulgaria. "We did not then know that he [Hitler] was already deeply set upon his gigantic invasion of Russia. If we had we should have felt more confidence in the success of our policy. We should have seen that he risked falling between two stools, and might easily impair his supreme undertaking for the sake of a Balkan preliminary. This is what actually happened, but we could not know that at the time. Some may think we builded rightly; at least we builded better than we knew at the time. It was our aim to animate and combine Yugoslavia, Greece, and Turkey. Our duty so far as possible was to aid the Greeks." The mountainous terrain of Greece favored a defensive strategy, and the high ranges of the Rhodope, Epirus, Pindus, and Olympus mountains offered many opportunities to stop an invader. However, adequate air power was required to prevent defending ground forces from becoming trapped in the many defiles. Although an invading force from Albania can be stopped by a relatively small number of troops positioned in the high Pindus mountains, the northeastern part of the country was difficult to defend against an attack from the north. General Dill described Papagos' attitude as "unaccommodating and defeatist," arguing that his plan disregarded the fact that Greek troops and artillery were capable of only token resistance. The British believed that the Greek rivalry with Bulgaria—the Metaxas Line was designed specifically for use in the event of war with Bulgaria—as well as their traditionally good terms with the Yugoslavs, left their north-western border largely undefended. Despite their concerns over the vulnerability of the border system, and their awareness that it was likely to collapse in the event of a German thrust from the Strimon and Axios rivers, the British eventually conceded to the Greek command. On March 4, Dill accepted the plans for the Metaxas line, and on March 7, agreement was ratified by the British Cabinet. The overall command was to be retained by Papagos, and the Greek and British commands resigned themselves to fighting a delaying action in the northeastern part of the country. Nevertheless, the British did not move their troops, because General Wilson regarded them as too weak to maintain such a broad front line. Instead, he took a position some 40 miles west of the Axios, across the Haliacmon Line. The two main objectives in establishing this position were to maintain contact with the Greek First Army in Albania, and to deny German access to Central Greece. This had the advantage of requiring a smaller force than other options, while still allowing more time for preparation. However, it meant abandoning nearly the whole of Northern Greece, and was thus unacceptable to the Greeks for both political and psychological reasons. Moreover, the left flank of the line was susceptible to flanking from Germans operating through the Monastir gap in Yugoslavia. However, the possibility of a rapid disintegration of the Yugoslav Army, and a German thrust into the rear of the Vermion position, was not taken into consideration. The Fifth Yugoslav Army was given responsibility for the defense of the southeastern border between Kriva Palanka and the Greek border. At the time of the German attack, the Yugoslav troops were not yet fully mobilized, and lacked a sufficient amount of modern equipment or weapons to be fully effective. Following the entry of German forces into Bulgaria, the majority of Greek troops were evacuated from Western Thrace. By this time, the total strength of the Greek forces defending the Bulgarian border totaled roughly 70,000 men, under the command of the Greek Second Army. The remainder of the Greek forces—the First Army, composed of 14 divisions—was committed in Albania. The German plan of attack was informed by their army's experiences during the Battle of France. Their strategy was to create a diversion through the campaign in Albania, thus stripping the Greek Army of sufficient manpower for the defense of their Yugoslavian and Bulgarian borders. By driving armored wedges through the weakest links of the defense chain, the ability to penetrate into enemy territory would be more easily achieved, and would not necessitate the maneuver of their armor behind an infantry advance. Once the weak defense system of Southern Yugoslavia were overrun by German armor, the Metaxas Line could be outflanked by highly mobile forces thrusting southward from Yugoslavia. Thus possession of Monastir and the Axios valley leading to Thessaloniki became essential for such an outflanking maneuver. German advance until April 9, 1941, when the 2nd Panzer Division seized Thessaloniki. On the dawn of April 6, the German armies invaded Greece, while the Luftwaffe began an intensive bombardment of Belgrade. The XL Panzer Corps—which had been intended for use in an attack across southern Yugoslavia—began their assault at 05:30A.M., and made thrusts across the Bulgarian frontier at two separate points. By the evening of April 8, the 1st SS Division Adolf Hitler captured Prilep, thus severing an important rail line between Belgrade and Thessaloniki, and isolating Yugoslavia from its allies. The Germans were now in possession of terrain which was favorable to the continuation of the offensive. On the evening of April 9, General Stumme deployed his forces north of Monastir, in preparation for the extension of the attack across the Greek border toward Florina. This position threatened to encircle the Greeks in Albania and W Force in the area of Florina, Edessa, and Katerini. While weak security detachments covered the rear of his corps against a surprise attack from central Yugoslavia, elements of the 9th Panzer Division drove westward to link up with the Italians at the Albanian border. The Metaxas Line was defended by the Eastern Macedonia Army Section, which comprised the 7th, 14th and 17th Infantry Divisions under the command of Lieutenant General Konstantinos Bakopoulos. The line ran for about 170 km along the river Nestos to the east, and then to the east following the Bulgarian border as far as Mount Beles near the Yugoslav border. The fortifications were designed to garrison an army of over 200,000 troops, but due to a lack of available manpower, the actual number was roughly 70,000. As a result of the low numbers, the line's defenses were thinly spread. The initial German attacks against the line were undertaken by a single German infantry unit reinforced by two mountain divisions of the XVIII Mountain Corps. These first forces encountered strong resistance, and had limited success. A German report at the end of the first day described how the German 5th Mountain Division "was repulsed in the Rupel Pass despite strongest air support and sustained considerable casualties." Of the 24 forts which made up the Metaxas Line, only two had fallen, and then only after they had been destroyed. The line was penetrated following a three-day struggle during which the Germans pummeled the forts with artillery and dive bombers. The main credit for this achievement must be given to the 6th Mountain Division, which crossed a 7,000-foot (2,100 m) snow-covered mountain range and broke through at a point that had been considered inaccessible by the Greeks. The force reached the rail line to Thessaloniki on the evening of April 7. The other XVIII Mountain Corps units advanced step by step under great hardship. The 5th Division, together with the reinforced 125th Infantry Regiment, penetrated the Strimon defenses on April 7, and attacked along both banks of the river, clearing one bunker after another as they passed. Nevertheless the unit suffered heavy casualties, to the extent that it was withdrawn from further action after it had reached its objective location. The 72d Infantry Division advanced from Nevrokop across the mountains, and, although it was handicapped by a shortage of pack animals, medium artillery, and mountain equipment, it managed to break through the Metaxas Line on the evening of April 9, when it reached the area northeast of Serres. Even after General Bakopoulos surrendered the Metaxas Line, isolated fortresses held out for days, and were not taken until heavy artillery was utilized against them. Some field troops and soldiers manning the frontier continued to fight on, and as a result a number were able to evacuate by sea. The dispositions of forces in the Florina Valley, April 10, 1941. The blue arrows indicate German advances and the Allied lines are shown in red. Vevi and the Klidi Pass are upper centre, the Australian 19th Brigade HQ is in the center and Mackay Force HQ is at Perdika, lower center. By the morning of April 10, the XL Panzer Corps had finished its preparations for the continuation of the offensive, and continued the advance in the direction of Kozani. Against all expectations, the Monastir gap had been left open, and the Germans exploited their chance. First contact with Allied troops was made north of Vevi at 11:00A.M. on April 10. SS troops seized Vevi on April 11, but were stopped at the Klidi Pass just south of the town, where a mixed Commonwealth-Greek formation, known as Mackay Force, was assembled to, as Wilson put it, " …stop a blitzkrieg down the Florina valley." During the next day the SS regiment reconnoitered the enemy positions, and at dusk launched a frontal attack against the pass. Following heavy fighting, the Germans overcame the enemy resistance, and broke through the defense. By the morning of April 14, the spearheads of the 9th Panzer Division reached Kozani. Wilson faced the prospect of being pinned by Germans operating from Thessaloniki, while being flanked by the German XL Panzer Corps descending through the Monastir Gap. On April 13, he decided to withdraw all British forces to the Haliacmon river, and then to the narrow pass at Thermopylae. On April 14 the 9th Panzer Division established a bridgehead across the Haliacmon river, but an attempt to advance beyond this point was stopped by intense enemy fire. This defense had three main components: the Platamon tunnel area between Olympus and the sea, the Olympus pass itself, and the Servia pass to the southeast. By channeling the attack through these three defiles, the new line offered far greater defensive strength for the limited forces available. The defenses of the Olympus and Servia passes consisted of the 4th New Zealand Brigade, 5th New Zealand Brigade, and the 16th Australian Brigade. For the next three days the advance of the 9th Panzer Division was stalled in front of these resolutely held positions. Australian anti-tank gunners resting, soon after their withdrawal from the Vevi area. The New Zealand battalion withdrew, crossed the Pineios river, and by dusk reached the western exit of the Pineios Gorge, suffering only light casualties. Macky was informed that it was "essential to deny the gorge to the enemy till April 19 even if it meant extinction." He sank the crossing barge at the western end of the gorge once all his men were across and began to set up defenses. The 21st battalion was reinforced by the Australian 2/2nd Battalion and later by the 2/3rd, this force became known as Allen force after Brigadier "Tubby" Allen. The 2/5th and 2/11th battalions moved to the Elatia area south-west of the gorge and were ordered to hold the western exit possibly for three or four days. General Papagos rushed Greek units to the Metsovon pass where the Germans were expected to attack. On April 18, a pitched battle between several Greek units and the Leibstandarte SS Adolf Hitler brigade—which had by then reached Grevena—erupted. The Greek units lacked the equipment necessary to fight against a motorized unit and were soon encircled and overwhelmed. 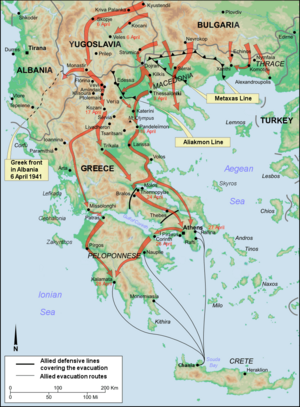 The Germans advanced further and on April 19 captured Ioannina, the final supply route of the Greek First Army. Allied newspapers dubbed the Greek army's fate as a modern day Greek tragedy. Historian and former war-correspondent, Christopher Buckley, when describing the fate of the Greek army, states that "one experience[d] a genuine Aristotelian catharsis, an awe-inspiring sense of the futility of all human effort and all human courage." On April 20, the commander of the Greek forces in Albania, General Georgios Tsolakoglou, realized the hopelessness of the situation and offered to surrender his army, which then consisted of 14 divisions. World War II historian John Keegan writes that Tsolakoglou "was so determined […] to deny the Italians the satisfaction of a victory they had not earned that […] he opened quite unauthorized parley with the commander of the German SS division opposite him, Sepp Dietrich, to arrange a surrender to the Germans alone." On strict orders from Hitler negotiations were kept secret from the Italians, and the surrender was accepted. Outraged by this decision Mussolini ordered counterattacks against the Greek forces, which were repulsed. It took personal representation from Mussolini to Hitler to bring together an armistice in which Italy was included on April 23. Greek soldiers were not treated as prisoners of war, and were allowed instead to go home after the demobilization of their units, while their officers were permitted to retain their side arms. To allow an evacuation of the main body of British forces, Wilson ordered the rear guard to make a last stand at the historic Thermopylae pass, the gateway to Athens. General Freyberg was given the task of defending the coastal pass, while Mackay was to hold the village of Brallos. After the battle Mackay was quoted as saying "I did not dream of evacuation; I thought that we'd hang on for about a fortnight and be beaten by weight of numbers." When the order to retreat was received on the morning of April 23 it was decided that each of the two positions was to be held by one brigade each. These brigades, the Australian 19th and 6th New Zealand were to hold the passes as long as possible, allowing the other units to withdraw. The Germans attacked on April 24 at 11:30A.M., met fierce resistance, lost 15 tanks and sustained considerable casualties. The Allies held out the entire day; with the delaying action accomplished, they retreated in the direction of the evacuation beaches and set up another rearguard at Thebes. The Panzer units launching a pursuit along the road leading across the pass made slow progress because of the steep gradient and a large number of difficult hairpin bends. "The quarrel over the troops' victorious entry into Athens was a chapter to itself: Hitler wanted to do without a special parade, to avoid injuring Greek national pride. Mussolini, alas, insisted on a glorious entry into the city for his Italian troops. The Führer yielded to the Italian demand and together the German and Italian troops marched into Athens. This miserable spectacle, laid on by our gallant ally whom they had honorably beaten, must have produced some hollow laughter from the Greeks." After abandoning the Thermopylae area, the British rear guards withdrew to an improvised switch position south of Thebes, where they erected a last obstacle in front of Athens. The motorcycle battalion of the 2nd Panzer Division, which had crossed to the island of Euboea to seize the port of Chalcis, and had subsequently returned to the mainland, was given the mission of outflanking the British rear guard. The motorcycle troops encountered only slight resistance, and on the morning of April 27, 1941, the first Germans entered Athens, followed by armored cars, tanks, and infantry. They captured intact large quantities of POL (petroleum, oil and lubricants) several thousand tons of ammunition, ten trucks loaded with sugar and ten truckloads of other rations in addition to various other equipment, weapons, and medical supplies. Damage from the German bombing of Piraeus on April 6, 1941(Australian War Memorial, Canberra). In the morning of April 15, 1941, Wavell sent to Wilson the following message: "We must of course continue to fight in close cooperation with Greeks but from news here it looks as if early further withdrawal necessary." General Archibald Wavell, the commander of British Army forces in the Middle East, when in Greece on April 11–13, had warned Wilson that he must expect no reinforcements, and had authorized Major General Freddie de Guingand to discuss evacuation plans with certain responsible officers. Nevertheless, the British could not at this stage adopt or even mention this course of action; the suggestion had to come from the Greek Government. The following day Papagos made the first move when he suggested to Wilson that W Force should be withdrawn. Wilson informed Middle East Headquarters and on April 17 Rear admiral H. T. Baillie-Grohman was sent to Greece to prepare for the evacuation. That day Wilson hastened to Athens where he attended a conference with the King, Papagos, d'Albiac and Rear admiral Turle. In the evening, Koryzis after telling the King that he felt he had failed him in the task entrusted to him, committed suicide. On April 21 the final decision for the evacuation of the Commonwealth forces to Crete and Egypt was taken, and Wavell, in confirmation of verbal instructions, sent his written orders to Wilson. 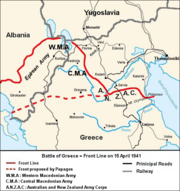 On the night of April 24, 5200 men, most of which belonged to the 5th New Zealand Brigade, were evacuated from Porto Rafti of East Attica, while the 4th New Zealand Brigade remained to block the narrow road to Athens, which was dubbed the 24 Hour Pass by the New Zealanders. On April 25 (Anzac Day), the few RAF squadrons left Greece (d'Albiac established his headquarters in Heraklion, Crete), and some 10,200 Australian troops were evacuated from Nauplion and Megara. 2000 more men had to wait until April 27, because Ulster Prince ran aground in shallow waters close to Nauplion. Because of this event, the Germans realized that the evacuation was also taking place from the ports of East Peloponnese. On April 25, the Germans staged an airborne operation to seize the bridges over the Corinth canal, with the double aim of both cutting off the British line of retreat and securing their own way across the isthmus. The attack met with initial success, until a stray British shell destroyed the bridge. The 1st SS Motorized Infantry Regiment, assembled at Ioannina, thrust along the western foothills of the Pindus Mountains via Arta to Messolonghi, and crossed over to the Peloponnese at Patras in an effort to gain access to the isthmus from the west. Upon their arrival at 5:30P.M. on April 27 the SS forces learned that the paratroops had already been relieved by Army units advancing from Athens. The erection of a temporary span across the Corinth canal permitted 5th Panzer Division units to pursue the enemy forces across the Peloponnese. Driving via Argos to Kalamata, from where most Allied units had already begun to evacuate, they reached the south coast on April 29, where they were joined by SS troops arriving from Pyrgos. The fighting on the Peloponnese consisted merely of small-scale engagements with isolated groups of British troops who had been unable to make ship in time. The attack came a few days too late to cut off the bulk of the British troops in Central Greece, but did manage to isolate the Australian 16th and 17th Brigades. By April 30 the evacuation of about 50,000 soldiers was completed,g[›] but was heavily contested by the German Luftwaffe, which sank at least twenty-six troop-laden ships. The Germans captured around 7000–8000 Commonwealth (including 2000 Cypriots and Palestinians) and Yugoslav troops in Kalamata who had not been evacuated, while liberating many Italian prisoners from POW camps. The occupation of Greece, during which civilians suffered terrible hardships, and died from privation and hunger, proved to be a difficult and costly task. It led to the creation of several resistance groups, which launched guerrilla attacks against the occupying forces and set up espionage networks. On April 25, 1941, King George II and his government left the Greek mainland for Crete, which was attacked by Nazi forces on May 20, 1941. The Germans employed parachute forces in a massive airborne invasion, and launched their offensive against three main airfields of the island in Maleme, Rethymno, and Heraklion. After seven days of fighting and tough resistance, Allied commanders decided that the cause was hopeless, and ordered a withdrawal from Sfakia. By June 1, 1941, the evacuation of Crete by the Allies was complete and the island was under German occupation. In light of the heavy casualties suffered by the élite 7th Flieger Division, Hitler forbade further airborne operations. German Luftwaffe Gen. Kurt Student would dub Crete "the graveyard of the German paratroopers" and a "disastrous victory." During the night of May 24, George II and his government were evacuated from Crete to Egypt. April 6, 1941 The German armies invade Greece. April 8, 1941 The German 164th Infantry Division captures Xanthi. April 9, 1941 German troops seize Thessaloniki. April 10, 1941 The Germans overcome the enemy resistance north of Vevi, at the Klidi Pass. April 13, 1941 General Wilson decides to withdraw all British forces to the Haliacmon river, and then to Thermopylae. April 14, 1941 The spearheads of the 9th Panzer Division reach Kozani. April 16, 1941 Wilson informs General Papagos of his decision to withdraw to Thermopylae. April 17, 1941 Rear admiral H. T. Baillie-Grohman is sent to Greece to prepare for the evacuation of the Commonwealth forces. April 18, 1941 After a three-days struggle, German armored infantry crosses the Pineios river. April 19, 1941 German troops enter Larissa and take possession of the airfield. April 20, 1941 The commander of the Greek forces in Albania, General Georgios Tsolakoglou, offers to surrender his army to the Germans alone. April 21, 1941 The final decision for the evacuation of the Commonwealth forces to Crete and Egypt is taken. April 24, 1941 The Germans attack the Commonwealth forces at Thermopylae. The British rear guards withdraw to Thebes. April 25, 1941 The few RAF squadrons leave Greece. Some 10,200 Australian troops are evacuated from Nauplion and Megara. April 27, 1941 The first Germans enter Athens. April 28, 1941 Italian troops start occupying the Ionian and Aegean islands. April 29, 1941 5th Panzer Division units reach the south coast of Peloponnese, where they are joined by SS troops arriving from Pyrgos. April 30, 1941 The evacuation of 42,311 Commonwealth soldiers is completed. The Germans manage to capture around 7-8,000 Commonwealth troops. According to German filmmaker Leni Riefenstahl, Hitler said that "if the Italians hadn't attacked Greece and needed our help, the war would have taken a different course. We could have anticipated the Russian cold by weeks and conquered Leningrad and Moscow. There would have been no Stalingrad". Despite his reservations, Brooke seems also to have conceded that the start of the German offensive against the Soviet Union was in fact delayed because of the Balkan Campaign. There were political consequences from this campaign for the population of Greece. Had the Greek government held onto some foothold in Greece, such as Crete, they might have maintained a greater degree of legitimacy in the eyes of the Greek population. Their lack of legitimacy could have been a precipitating factor for the civil war. ^ a: On two preceding occasions Hitler had agreed that the Mediterranean and Adriatic were exclusively Italian spheres of interest. Since Yugoslavia and Greece were situated within these spheres, Mussolini felt entitled to adopt whatever policy he saw fit. ^ b: According to the U.S. Army Center of Military History, "the almost immediate setbacks of the Italians only served to heighten Hitler's displeasure. What enraged the Führer most was that his repeated statements of the need for peace in the Balkans had been ignored by Mussolini." ^ c: According to Buckley, Mussolini preferred that the Greeks would not accept the ultimatum but that they would offer some kind of resistance. Buckley writes, "documents later discovered showed that every detail of the attack had been prepared…. His prestige needed some indisputable victories to balance the sweep of Napoleonic triumphs of Nazi Germany." This, incidentally, disposes of the German assertion that they were forced to attack us only in order to expel the British from Greece, for they knew that, if they had not marched into Bulgaria, no British troops would have landed in Greece. Their assertion was merely an excuse on their part to enable them to plead extenuating circumstances in justification of their aggression against a small nation, already entangled in a war against a Great Power. But, irrespective of the presence or absence of British troops in the Balkans, German intervention would have taken place firstly because the Germans had to secure the right flank of the German Army which was to operate against Russia according to the plans already prepared in autumn 1940, and secondly because the possession of the southern part of the Balkan Peninsula commanding the eastern end of the Mediterranean was of great strategic importance for Germany's plan of attacking Great Britain and the line of Imperial communications with the East. 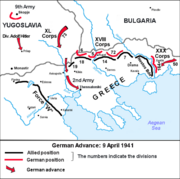 ^ e: During the night of April 6, 1941, and while the German invasion had already began, the Yugoslavs informed the Greeks that they would implement the plan: they would attack the Italian troops in the morning of the next day at 6:00A.M. At 3:00A.M. of April 7 the thirteenth division of the Greek First Army attacked the Italian troops, occupied two heights, and captured 565 Italians (15 officers and 50 soldiers). Nevertheless, the Yugoslav offensive would not take place, and on April 8 the Greek headquarters ordered the pause of the operation. ^ f: Although earmarked for Greece, the Polish Independent Carpathian Rifle Brigade and the Australian 7th Division were kept by Wavell in Egypt because of Erwin Rommel's successful thrust into Cyrenaica. ^ g: Sources do not agree on the number of the soldiers the British Commonwealth managed to evacuate. According to British sources, 50,732 soldiers were evacuated. But of these, according to G. A. Titterton, 600 men were lost in the troopship (formerly Dutch liner) Slamat. Adding 500–1000 stragglers who reached Crete, Titterton estimates that "the numbers that left Greece and reached Crete or Egypt, including British and Greek troops, must have been around 51,000." Gavin Long (part of Australia's official history of World War II) gives a figure around 46,500, while, according to W. G. McClymont (part of New Zealand's official history of World War II), 50,172 soldiers were evacuated. McClymont points out that "the differences are understandable if it is remembered that the embarkations took place at night and in great haste and that among those evacuated there were Greeks and refugees." ↑ Richard Collier. Duce! (Viking Adult, 1971. ISBN 9780670286034), 180; "Greek Wars" in Encyclopaedia "The Helios". Earl F. Ziemke, World War II Commemmoration, Balkan Campaigns Grolier.com. Retrieved December 20, 2008. Gavin Long. Australia in the War of 1939–1945. Volume II – Greece, Crete and Syria. (Canberra: Australian War Memorial, 1953), 182–183 Retrieved December 20, 2008. W. G. McClymont. To Greece. The Official History of New Zealand in the Second World War 1939–1945. (Wellington: Historical Publications Branch, 1959), 486 Retrieved December 20, 2008. ↑ "Greek Wars." Encyclopaedia "The Helios". Adolf Hitler, Speech to the Reichstag on May 4, 1941 Retrieved December 20, 2008. ↑ "Greece, History of" in Encyclopaedia "The Helios"
↑ Southern Europe, World War-2.net. Retrieved December 20, 2008.
; More U-boat Aces Hunted down, OnWar.Com Retrieved December 20, 2008. ↑ 20.0 20.1 George E. Blau and U.S. Army Center of Military History. The German Campaigns in the Balkans (Spring 1941). (original 1953). republished 1986 United States Army Center of Military History, Reissue. ed. [[Washington DC: (CMH Pub 104-4), 70–71. Retrieved December 20, 2008. ↑ Blau, 5 Retrieved December 20, 2008. ↑ Blau, 5–7 Retrieved December 20, 2008. McClymont, 158–159 Retrieved December 20, 2008. ↑ McClymont, 158 Retrieved December 20, 2008. ↑ M. B. Barrass, Air Marshal Sir John D'Albiac Air of Authority - A History of RAF Organisation. rafweb.org. Retrieved December 20, 2008. ↑ Blau, 71–72 Retrieved December 20, 2008. ↑ "Greece, History of" The Helios. ↑ Blau, 74. Retrieved December 20, 2008. ↑ Balkan Operations – Order of Battle – W-Force – April 5, 1941, Orders of Battle. Retrieved December 20, 2008. ↑ 38.0 38.1 38.2 38.3 Blau, 77. Retrieved December 20, 2008. Earl F. Ziemke, Balkan Campaigns. grolier.com. Retrieved December 20, 2008. ↑ McClymont, 1959, 106–107. nzetc.org. Retrieved December 20, 2008. McClymont, 107–108.nzetc.org. Retrieved December 20, 2008. Ziemke, Balkan Campaigns. Retrieved December 20, 2008. ↑ Blau, 79. Retrieved December 20, 2008. ↑ Blau, 79–80. Retrieved December 20, 2008. ↑ Blau, 81. Retrieved December 20, 2008. ↑ Blau, 82–83 Retrieved December 20, 2008. ↑ Blau, 83–84 Retrieved December 20, 2008. ↑ McClymont, 160.nzetc.org. Retrieved December 20, 2008. ↑ Blau, 86. Retrieved December 20, 2008. ↑ Blau, 87. Retrieved December 20, 2008. Blau, 88. Retrieved December 20, 2008. ↑ Blau, 88. Retrieved December 20, 2008. Blau, 89. Retrieved December 20, 2008. ↑ Blau, 89–91. Retrieved December 20, 2008. ↑ Australia's War 1939-1945. The Roof is Leaking, Australian Department of Veterans' Affairs. Retrieved December 20, 2008. ↑ Blau, 91. Retrieved December 20, 2008. Long, 96.awm.gov. Retrieved December 20, 2008. ↑ 66.0 66.1 Blau, 98. Retrieved December 20, 2008. ↑ Long, 96. Retrieved December 20, 2008. ↑ Long, 96–97. Retrieved December 20, 2008. ↑ Long, 98–99. Retrieved December 20, 2008. ↑ Blau, 100. Retrieved December 20, 2008. ↑ 73.0 73.1 73.2 73.3 Blau, 94. Retrieved December 20, 2008. ↑ Long, 95. (PDF) Retrieved December 20, 2008. ↑ Blau, 103. Retrieved December 20, 2008. ↑ Long, 1953,143 Retrieved December 20, 2008. ↑ Blau, 104. Retrieved December 20, 2008. ↑ 84.0 84.1 84.2 Blau, 111. Retrieved December 20, 2008. ↑ Robert Menzies, The Greek campaign: Menzies' 1941 Diary. 1941 Diary. Museum of Australia, Old Parliament House, Canberra. Retrieved December 20, 2008. ↑ Long, 104–105. (PDF) Retrieved December 20, 2008. ↑ McClymont, 362. Retrieved December 20, 2008. ↑ Long, 112. Retrieved December 20, 2008. ↑ McClymont, 362–363. Retrieved December 20, 2008. ↑ Blau, 108. Retrieved December 20, 2008. McClymont, 471–472. Retrieved December 20, 2008. ↑ 102.0 102.1 102.2 102.3 102.4 Blau, 116–118. Retrieved December 20, 2008. ↑ McClymont, 471–472. Retrieved December 20, 2008. ↑ Blau, 3–4. Retrieved December 20, 2008. ↑ George Duncan, More Maritime Disasters Retrieved December 20, 2008. McClymont, 486. Retrieved December 20, 2008. ↑ McClymont, 486. Retrieved December 20, 2008. All links Retrieved December 18, 2008. Balkan Operations – Order of Battle – W-Force – April 5, 1941. Orders of Battle. Bailey, Robert H. Partisans and Guerrillas (World War II). Time Life UK, 1979. ISBN 0809424908. Barber, Laurie, and John Tonkin-Covell. Freyberg: Churchill's Salamander. Hutchinson: Random House (NZ), 1990. ISBN 1869410521. Barrass, M. B. Air Marshal Sir John D'Albiac. Air of Authority - A History of RAF Organisation. rafweb.org. Retrieved October 24, 2009. Bitzes, John. 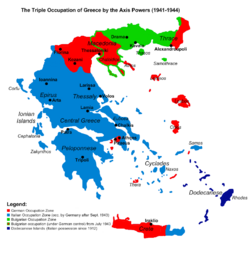 Greece in World War II: To April 1941. Sunflower University Press, 1989. ISBN 0897450930. Bosworth, R.J.B. Mussolini. Oxford, UK: A. Hodder Arnold Publication, 2002. ISBN 0340731443. Bradley, John N., and Thomas B. Buell. The Second World War: Europe and the Mediterranean (The West Point Military History Series). Garden City Park, NY: Square One Publishers, Inc., 2002. ISBN 0757001602 chapter "Why Was Barbarossa Delayed?" "Brallos Pass" in The Encyclopaedia of Australia's Battles. Allen & Unwin, 2001. ISBN 9781865086347. Buckley, Christopher. Greece and Crete 1941. (original 1952) republished Athens: P. Efstathiadis & Sons S.A., 1984. ISBN 9780117721937. "Campaign in Greece" in The Encyclopedia Americana 2000. Grolier. ISBN 9780717201228. Carlton, Eric. Occupation: The Policies and Practices of Military Conquerors. Routledge, 1992. ISBN 0415058465. Celebration of Greek Armed Forces in Washington - Remarks by Secretary for Veteran Affairs, Mr Jim Nicholson. Press Office of the Embassy of Greece 2006-11-24. __________. Memoirs of the Second World War. Houghton Mifflin Books, 1991. ISBN 0395599687. chapter "Yugoslavia and Greece." Collier, Richard. Duce! Viking Adult, 1971. ISBN 9780670286034. D'Albiac, Sir John, Air Marshal. . Air of Authority - A History of RAF Organisation. ww2australia.gov. Duncan, George, More Maritime Disasters of World War II. Historical Facts of World War II. "Greece (World War II)" in An Encyclopedia of Battles, David Eggenberger. Courier/Dover, 1985. ISBN 9780486249131. Fafalios, Maria, and Costas Hadjipateras. Greece 1940–41: Eyewitnessed. (in Greek) Athens: Efstathiadis Group, 1995. ISBN 9602265337. Goebbels, Joseph. Joseph Goebbels; Diaries, 1939–41, translated by Fred Taylor. Hamish Hamilton Ltd, 1982. ISBN 0241108934. Goldstein, Erik. Wars and Peace Treaties. Routledge, 1992. ISBN 0415078229. chapter "Second World War 1939–1945." Hondros, John. Occupation and Resistance: The Greek Agony 1941–44. Pella Pub Co., 1983. ISBN 0918618193. Jerasimof Vatikiotis, Panayiotis. Popular Autocracy in Greece, 1936–41: a Political Biography of General Ioannis Metaxas. Routledge, 1998. ISBN 0714648698. chapter "Metaxas Becomes Prime Minister." Keegan, John. The Second World War. Penguin (Non-Classics); Reprint edition, 2005. ISBN 0143035738. Kirchubel, Robert. "Opposing Plans", Operation Barbarossa 1941 (2): Army Group North. Osprey Publishing, 2005. ISBN 184176857X. Lawlor, Sheila. Churchill and the Politics of War, 1940–1941. Cambridge University Press, 1994. ISBN 0521466857. Lee, Stephen J. European Dictatorships, 1918–1945. Routledge, 2000. ISBN 0415230454. Long, Gavin. Australia in the War of 1939–1945. Volume II – Greece, Crete and Syria. Canberra: Australian War Memorial, 1953. Chapters 1 to 9 . Macdougall, A. K. Australians at War: A Pictorial History. Scoresby, Victoria, AUS: The Five Mile Press, 2004. ISBN 1865038652. McClymont, W.G. To Greece. The Official History of New Zealand in the Second World War 1939–1945. chapter Chapters 6 - 22. Wellington: Historical Publications Branch, 1959. Menzies, Robert. The Greek campaign: Menzies' 1941 Diary. Old Parliament House, Canberra. More U-boat Aces Hunted down (Sunday, March 16, 1941). Chronology of World War II. OnWar.com. Murray, Williamson, and Allan Reed Millett. "Diversions in the Mediterranean and Balkans," A War to Be Won: Fighting the Second World War. Harvard University Press, 2000. ISBN 0674006801. Neville, Peter. Mussolini. Routledge, 2003. ISBN 0415249899. Papagos, Alexandros. The Battle of Greece 1940–1941. (in Greek). Athens: J. M. Scazikis Alpha, 1949. Pelt, Mogens. Tobacco, Arms and Politics: Greece and Germany from World Crisis to World War, 1929–1941. Museum Tusculanum Press, 1998. ISBN 8772894504. Richter, Heinz A. Greece in World War II, (translated from the German original by Kostas Sarropoulos). (in Greek). Athens: Govostis, 1998. Riefenstahl, Leni. Leni Riefenstahl: A Memoir. Picador New York, USA, 1987. ISBN 0312119267. Rodogno, Davide. Fascism's European Empire: Italian Occupation During the Second World War, translated by Adrian Belton. Cambridge University Press, 2006. ISBN 9780521845151. The Roof is Leaking. Australia's Wars 1939–1945. Australian Department of Veterans' Affairs. Roosevelt, Franklin D. Franklin D. Roosevelt, President Roosevelt to King George of Greece, December 5, 1940. Peace and War: United States Foreign Policy, 1931–1941. Svolopoulos, Konstantinos. The Greek Foreign Policy. (in Greek) Estia, 1997. ISBN 9600504326. Titterton, G. A. The Royal Navy and the Mediterranean. Routledge, 2002. ISBN 0714652059. chapter British Evacuate Greece. Vick, Alan. Snakes in the Eagle's Nest: A History of Ground Attacks on Air Bases. Rand Corporation, 1995. ISBN 0833016296. chapter The German Airborne Assault on Greece. Ziemke, Earl F., Balkan Campaigns. World War II Commemmoration Grolier.com. Bevin, Alexander. How Hitler Could Have Won World War II: The Fatal Errors That Led to Nazi Defeat. Three Rivers Press; Reprint ed. 2001. ISBN 0609808443. Cervi, Mario. The Hollow Legions. London: Chatto and Windus, 1972. ISBN 0701113510. Hellenic Army General Staff. An Abridged History of the Greek-Italian and Greek-German War. Athens: Army History Directorate Editions, 1997. OCLC 45409635. Lannoy, Francois de. Operation Marita-April 1941: La Guerre dans les Balkans. (in French). Editions Heimdal, 2001. ISBN 2840481243. Mazower, Mark. Inside Hitler's Greece: The Experience of Occupation, 1941–44. New Haven: Yale University Press, 2001. ISBN 0300089236. Playfair, Major General I.S.O. (1956). The Mediterranean and Middle East Volume II: The Germans come to the help of their Ally (1941). Rigopoulos, Rigas. Secret War: Greece-Middle East 1940–1945: The Events Surrounding the Story of Service 5-16-5. Turner Publishing Company, 2003. ISBN 1563118866. Shores, Christopher. Air War for Yugoslavia, Greece, and Crete 1940–1941. Grub Street, 1992. ISBN 0948817070. Stassinopoulos, Costas. A Modern Greeks: Greece in World War II: The German Occupation and National Resistance and Civil War. American Hellenic Institute Foundation, Inc., 2005. ISBN 1889247014. Willingham, Mathew. Perilous Commitments: The Battle for Greece and Crete 1940–1941. Spellmount Publishers, 2005. ISBN 1862272360. Zotos, Stephanos. Greece: The Struggle For Freedom. 1967. ASIN B0006BRA38. Judgement: The Aggression Against Yugoslavia and Greece. The Avalon Project at Yale Law School. The Greek Campaign, 1941. Australian War Memorial. History of "Battle of Greece"
This page was last modified on 17 May 2016, at 14:50.